Custom brogue modifications* done for you in Hamilton. or similar, from most mens shoe shops. Spare laces and tassels available. Modern Ghillie brogues are an adaption of the old raw hide brogue used by highlanders. They were made with hide punctured with holes to let water out (as well as in) and this helped feet and footwear to dry out more quickly in the wet/damp/ boggy conditions. These shoes are laced through leather tangs and do not have the tongue which covers the arch of your foot in normal shoes. 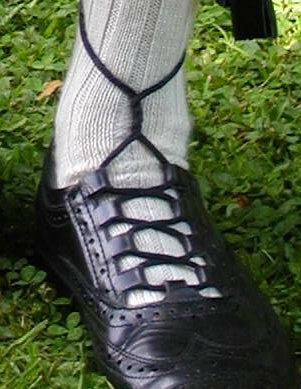 Though the ghillie brogue is now considered the normal style of footwear, the buckled shoe was probably more often worn by more of the population. Mind you, many folk in the highlands could ill afford any shoes and often went barefoot except for formal and special occasions. Today the ghillie brogue is worn with thick long hose, mainly white or cream, but available in other colours as well. eg. Lovat green, Lovat Blue, Grey, Navy, Oatmeal, and Tartan. Where the laces were once long leather thongs, they are now of braided threads, but are still long and wound around the ankle, or part way up the leg, and then tied off. .
Why, you may ask, would anyone want to have a pair of brogues converted into ghillie brogues? COST! Why pay top dollar for a shoe you only wear occasionally? Why not just get your old "business brogues" converted (while they still have plenty of wear left) when you purchase a new pair of work shoes (brogues of course). 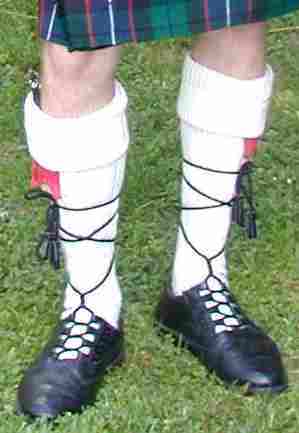 The conversions made to-date are now worn by pipers throughout NZ and even in Australia, Canada and the USA. Before buying a pair of new shoes for conversion, please note; for technical shoe construction reasons, there is one style of shoe that is ideal for conversion. Other designs can also be modified but the result is not quite as good. Refer to the drawings, (A) and (B) below. The area of most importance is the valence (the tongue and lacing part of the shoe). The pair on the left is shoe style (A). On the right is style (B). Style (A) is ideal for modifying. Style (B), is not quite as good, but can be modified easily. Most brogued shoes on sale now are this style. Style (A) being stitched during modification.